The first week of the Tour will suit the sprinters. Does that mean we’ll see one rider dominate the others, as Cavendish did in 2016 and Kittel did last year? This year, there is a new crop of talent that will be gunning to make its mark in July, including Caleb Ewan, Fernando Gaviria, and Dylan Groenewegen. It will be exciting to see how the different generations match up. 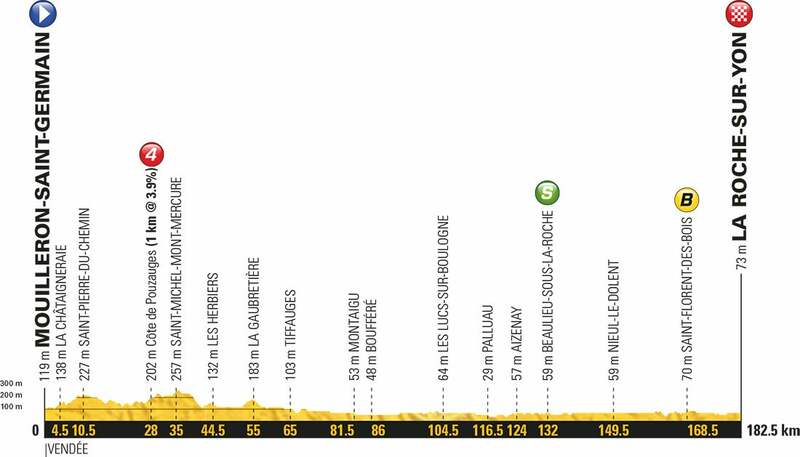 The stage 2 finale presents another serious test: a false flat of 3-4 percent and more than a kilometer long. After this stage, we should know more about the candidates for the green jersey. Peter Sagan won stage two of the 2018 Tour de France stage on Sunday in La Roche-sur-Yon. The world champion came around a fading Arnaud Démare (Groupama-FDJ) and held off a surging Sonny Colbrelli (Bahrain-Merida) to take his ninth career Tour stage win. A crash inside the final 2km took out a large swath of sprinters, including stage 1 winner and overall leader Fernando Gaviria (Quick Step-Floors) and Michael Matthews (Sunweb). Sagan’s 10-second time bonus for the stage win propelled him into the overall race lead. “I’m really happy for today and I want to say a big thanks to all my teammates because they were in the front for the last 30 kilometers,” said the world champion post-stage. “In the end, I expected something easier, but it was really tough. Up and down, turn right. I said, the later the start the better today. Demare, he started with Degenkolb, but I overtook him and I was really lucky Colbrelli didn’t jump me. While the slightly uphill finish was perfect for strong-men sprinters like Alexander Kristoff, the big Norwegian admitted he simply isn’t at his best. The 182.5-kilometer stage from Mouilleron-Saint-Germain and La Roche-sur-Yon through the Vendee region featured a lone breakaway by Sylvain Chavanel, whose Direct Energie team has roots in the host region. An intermediate sprint 50km from the finish saw Sagan take second behind the lone leader, with Gaviria coming in third and Kristoff scooping up the remaining points in fourth. Even though Chavanel posed no serious threat of stealing the stage, nerves, and pace, stayed high in the peloton throughout the stage. Mitchelton-Scott’s Adam Yates suffered an ill-timed crash with 30-kilometers remaining. While he was physically okay, he was forced to chase back on while the pace in the bunch ramped up in anticipation of the sprint finish. “It was super fast. It was ‘on’ pretty much all day. The pace was blistering, but we stayed out of trouble,” said BMC team leader and GC favorite Richie Porte. The sentiment was mirrored by Sky’s Geraint Thomas, who said that inside the final 70 kilometers, riders needed to be concentrated and switched on to avoid any mishaps in the constant fight for position. One of the pre-stage favorites, Marcel Kittel (Katusha-Alpecin), suffered a flat with 8kms remaining in the stage, which extinguished any chance the big German had of contending for the win. The tension in the bunch increased until a crash on the tight right-hander with just 2km to go saw much of the peloton — including Gaviria — taken out of contention for the win. Bora-Hansgrohe quickly took advantage of having several riders in the reduced front group and drove the pace. Inside the final meters, Sagan navigated the final uphill run to the finish perfectly to take his ninth career Tour de France stage victory as well as nabbing the overall leader’s jersey. The riders will get a temporary reprieve from the stress of fighting for position during tomorrow’s 35-kilometer team time trial. But while it won’t require fighting for position, the stage could be a decisive moment for anyone looking to take home the overall victory in Paris.